Forgive me, tap purists, but I often find tap dance performances like homework. Sure, I can appreciate the intricate rhythms made by the feet, but the shows can veer from outright show-biz to introverted, or to contained throw-downs between two dancers onstage. So along comes Michelle Dorrance and her skilled troupe of hoofers, with collaborator Nicholas Van Young, whose ETM—electronic tap music—helps craft a fully integrated, entertaining program of varied dynamics and segments, called ETM: Double Down, at the Joyce through this weekend. ETM refers to a set of primitive looking foot-square platforms connected by cables—like a giant octopus that morphs around the stage, its tentacles shifting so as to hang onto its prey. The dancers pick up the devices and move them, and then trigger their programmed sounds with their toes, as if hitting a piano key. (The motion reminds me of Tom Hanks in Big!, when he goes bonkers on the giant piano keyboard.) The emitted sounds evoke the xylophone, bells, chimes, piano, and are supplemented by an onstage band on drums, standing and electric bass, keyboard, and in the second half, soulful vocals by Aaron Marcellus. Each segment varies in dynamics, so there are plenty of quiet moments mixed in with the more physical tap numbers. Dorrance's diverse and multi-skilled company includes Nicholas Van Young, Byron Tittle, Caleb Teicher, Leonardo Sandoval, Warren Craft, Elizabeth Burke, and Ephrat Asherlie (who performs b-moves in sneakers). They frequently work together incredibly intricately—at moments, each dancer plays one note in a musical phrase. A number featured larger platforms with metal grids on one side, against which the dancers scraped their shoe plates for a unique sound. Dropped link chains added a cascading thudding sound. 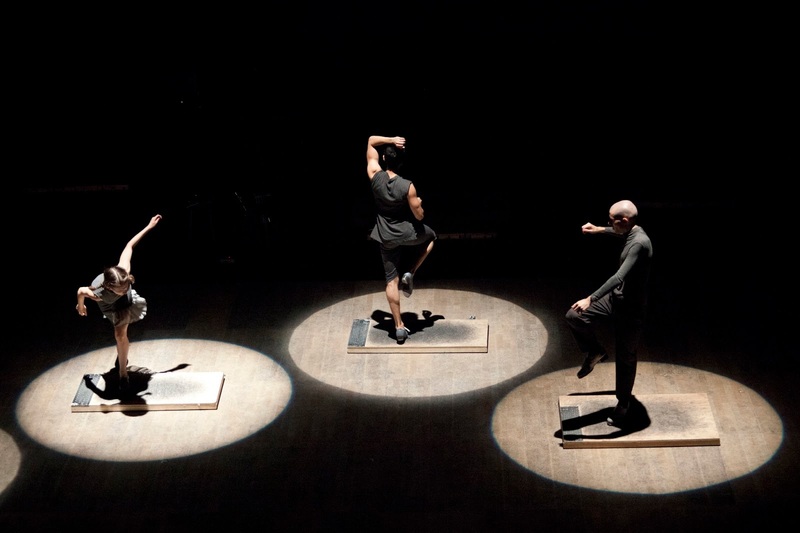 Dorrance's stage invention emerges in the way she situates or works a group of dancers around a soloist—in a traveling semicircle, with the chorus' backs to the featured dancer, or upstage on varied-level platforms, mingling with the band members. Her personal tap style is focused, her body somewhat contracted, with exaggerated knee lifts to precisely place each tap. Each of her company members has her/his own flair, but they work seamlessly as a team to realize some fascinating ideas that expand the art of tap.